The revenue authorities are inadequate ... There is an endless delay in the design of the landmarks of the temples, the patent book books, with the apathetic attitude of the deviate officers. There are some farmers who do not care if they get the patrons of the government lands. As a result, these lands are in their hands. These lands will come to cigarettes only if the revenue officials are cooperating in the village level. Everything seems to be moving around here. There is a coordination problem between revenue and the divisional department. There are many temple survey numbers, 1b, no hardship, and most of them are still in dependence. There are no papers or survey numbers for some of the lands that were given to the Covas during the kings and zamindars. The result was that 50% of the land was made by the Pattadar books. The government has started to computerize the temples of the area as part of the program 'Your Home to Your Land'. The temple land rights document and the applicant's patent books have been applied to the revenue department. Executive administrators of the temples in the revenue department and the divinity department have started to identify where the endowments are located in the respective zones. Injuries have been imposed for 38 mandates in the district. There are a lot of problems in the village level as revenue officials have not responded well despite the submission of applications through your service. Thereby, there is a subscription of the cemetery where the ecumenization of temple lands, issuing e-pass books. You need to know whether the temple lands are in the 1B account. First you have to apply for the name of the temple of God in your service center. This will have to pay Rs135 for a survey number. Instead of God Aadhaar, the executives of these temples, managers of Aadhaar numbers, God's pictures must be filled with applications. A survey number takes about twenty minutes from fifteen minutes to upload to the Internet. Such numbers range from 60 to 70 for some temples. Some temples are from one to two to two. Internet service servers are crying once the state is running. There are criticisms that executives who see temples and other things do not mind a few times. Even though the application process is completed at the Meessa Center, VRO, RI, Deputy Tehsildar and Tahsildar will be taken into consideration. They survey the temple lands survey numbers with revenue records. Do not accept applications if differently. To reopen this process, you need to pay the sum of each survey number. The cost burden is much higher for those surveyed numbers. This does not show enough attention. Officials say that the book will come in at least three months to get the book with the survey numbers approved in the Tahsildar office. In Chennai, e-Pass books are printed and returned to the office of the Tehsildar. There are hundreds of acres in the district. Fifty per cent of them have landed papers for books. 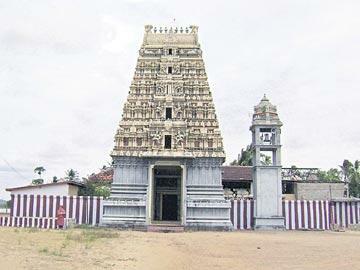 Some of the temples of the temples are located in the areas of Guntur Sitaram Ram, Arasavalli, Srikuram and Rajam. In the Narasanepeta area, hundreds of acres were found to be given books in the name of farmers. The district level officials reviewed and ordered them to be changed in the name of God. The temple has 388 acres at the temple of Sitaram Ram Temple and some 170 acres have been booked. Some books are reported in Chennai and some other office bearers.